Dartmoor is a small but quite extraordinary area of the south-west of England. Covering just 954 square kilometres it’s an unusual anomaly compared to the rolling green hills and woodlands in the south. Known for its granite hills called Tors it’s a mostly craggy landscape of few trees but epic views around every corner. In fact the views are almost painting like in quality and its history of grand manor houses and farms has created some great hotels nestled deep in the countryside. Prince Hall Country House sits right in the heart of Dartmoor and has been standing since 1787. The history of the building is quite incredible too. Built on the grounds of a house from the 1400s and owned by a succession of families, its been many things over the decades including a hospital for soldiers during the 2nd World War. Renovated in the 80s it’s now a very inviting hotel with just the right amount of grand hotel feel mixed with the homely charms of a family run establishment. After the beautiful drive through the moors you arrive at a pretty tree-lined drive-way over a small hill and down to the house. When we arrived there was a hive of activity from staff which gave the place a great atmosphere. From the hallway reception you get a tempting glimpse in to the lounge and bar, both rooms have fantastic views of the moors beyond Prince Hall. The cosy and crackling fire-place in the lounge with large chairs to sink in to really is the best spot to stare admiringly out of the window at the picture perfect scene outside. Our bedroom was equally cosy and a great size too. Ample room for our suitcases and all the features of the room. With large windows offering yet more views of the beautiful countryside. The room was tastefully decorated although personally I would prefer a few more paintings to liven up the plain walls. The bathroom was a wonderful traditional style with a decent shower and bath. A great space to relax and unwind after a day exploring the moors. One of the highlights of Prince Hall is definitely the dining experience. The menu is impressive and relaxing by the fire in the lounge was the perfect location to select our course and enjoy a bottle of wine. There’s a small but very well present dining room, relaxing music in the background and the occasional amuse-bouche to enjoy. We enjoyed starters of Pork, apple and chorizo terrine as well as Salmon with fennel olive and orange salad. More main we enjoyed perfectly cooked and wonderfully presented Rump of lamb with a tangy red currant jus and Honey roasted duck beast with Rosemary and orange jus. After our meal we returned to the lounge to enjoy the fireplace and meet the hotel cat, a beautiful Asian Blue who’s happy to sit on your lap for a cuddle. In fact the hotel is also dog friendly and with all that open space outside perfect for long walks with man’s best friend. Prince Hall have mastered the recipe for a great hotel. Big enough to have everything you need in a grand setting, small enough to feel you’re personally looked after by the owners and their staff. Very good food and some great spaces in which to enjoy the hotel. 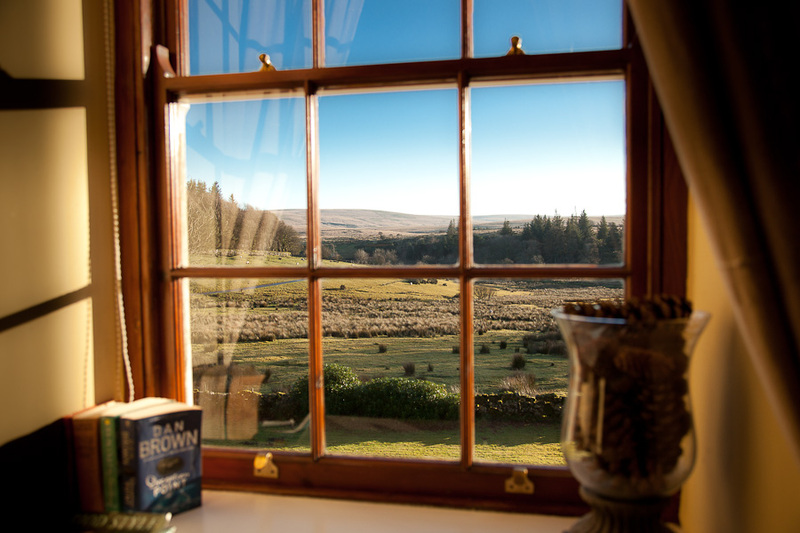 Coupled with painting like views all around the property is quite a setting for a holiday in Dartmoor. Our thanks to Price Hall Hotel in Dartmoor for their hospitality during our Great British Road Trip project..